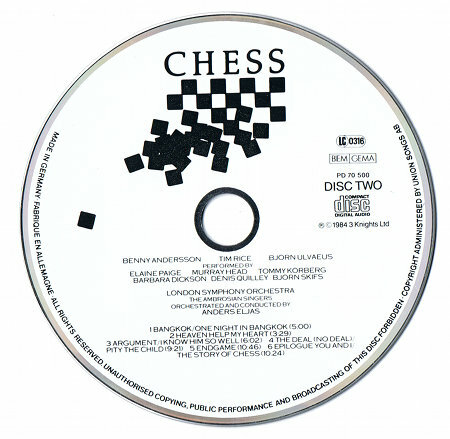 Released in 1984, the double album soundtrack to the musical Chess was Bjorn and Benny’s first post-Abba project, for which they teamed up with lyricist Tim Rice. The soundtrack actually appeared several years before the musical premiered – a working method that had been employed by Rice on his past projects with Andrew Lloyd Webber. Unlike Agnetha and Frida, Bjorn and Benny had never been signed to Polar as solo artists and the three composers decided to take advantage of this by forming their own company, 3 Knights, to control the rights to the album and musical. After much courting, however, Polar boss Stig Anderson secured the worldwide distribution rights to the album. Anderson’s enthusiasm for elaborate licencing deals had waned since Abba’s heyday and he simply retained the Scandinavian rights for Polar before sublicencing the rest of the world to RCA. Despite this simplified licencing arrangement, there are multiple versions of this album from the 1980s. 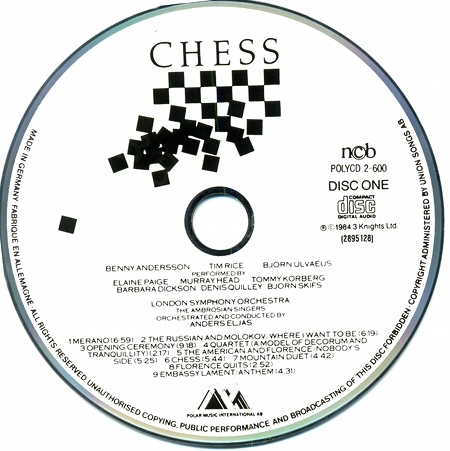 Firstly, there are several cosmetic differences between the RCA and Polar editions of Chess, most notably the fact that the RCA versions of Disc 1 and Disc 2 are black and white respectively while the Polar ones are the other way around. In the US, however, the company simply used it stock CD face design. Polar’s Disc 1 was white and their Disc 2 black…. …but RCA’s Disc 1 was black and Disc 2 was white. The slipcase containing the RCA version of the album has a huge RCA logo on the front and a barcode on the back. The Polar edition has neither of these things. Interestingly, however, the booklet for both editions is identical and only carries the album’s Polar catalogue number. The earliest RCA pressing didn’t contain the company’s logo on the CD face. There were also several variations of the RCA edition issued. Firstly, upon the album’s original release in 1984, RCA didn’t have any European CD manufacturing plants, forcing it to outsource all CD production to PolyGram’s plant in Hanover, West Germany. This arrangement lasted for several years but RCA eventually took its CD pressing for all its titles in-house. PolyGram discs can be identified by the printing on the hub on the data side of the CD, which should say “Made in Germany by PDO” or something similar. In addition, some early RCA pressings do not feature the record company’s logo on the CDs themselves. It is unclear why this is the case, particularly as there is space left in the design for a logo. In 1996, with RCA’s licence having expired, its version of the album was reissued globally on Polydor with unchanged mastering. But the packaging was pared back to a slim, two-CD case featuring a heavily shrunken booklet, which omitted some sections of the original altogether. These reissue discs can easily be identified by the prominent Polydor branding they carry. Titles in range: PD70500(2) [RCA] / POLYCD 2-600 [Polar]. Reissue: Polydor 847 455-2. I probably have the same version of Chess as you. Copyright states 1984, features both Polar and Polydor logos on the back and on the CDs, but no BIEM/MCPS. There is, however, an error indeed in Opening Ceremony, just like you described it. I just noticed that disk 1 had the names Embassy Lament and Anthem merged. I don’t hear anything wrong on my copy. Is it a very obvious error like a pop/click sound? Can the info on the link Flip provided be used or compared to the mastering database you’re compiling? The 1996 master of the CDs does have a slightly better dynamic range, as indicated here: http://www.dr.loudness-war.info/index.php?search_album=chess&sort=album&order=asc – this would indicate that at least the same master was not used. I bought the Polydor reissue (from 199?) 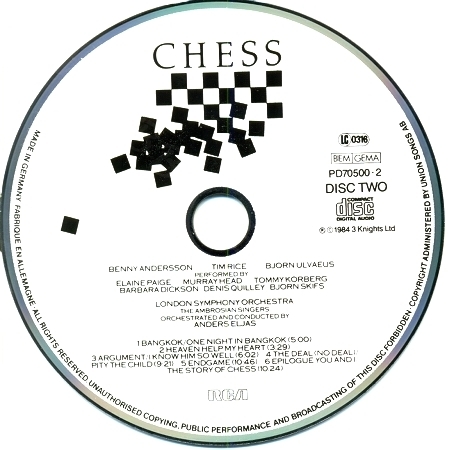 of Chess this week as second hand and it has what sounds as a mastering error at 4:19-4:20 at track 3: Opening Ceremony. Anyone else noticed this or is my copy flawed. Lee, is your copy really “made in UK” or purchased in UK as I’ve only seen editions with “made in Germany” printed on the sleeve. There’s also a made in Germany release with cd’s made in Japan. Disc one has black coating and disc 2 has white coating. There’s printed “Made in Japan” on the discs as well as having the Japanese “Jasrac” sign printed on the disc. The inner hub has matrix number PCD2-25340 which is the same as the American edition. However, the US edition doesn’t have the black or white coating on the disc. Sound level wise the US edition and the German with made in Japan discs are way lower compared to the Swedish Polar or European Polydor ones. I have a version (from the UK) of this that is almost identical, but the discs say ‘made in Japan’.